2012 Peggy Trowbridge Filippone, licensed to About.com, Inc. This dough works well to make for the holidays or any special occasion. The cream cheese adds a richness to the flavor and gives you an alternative other than only making butter cookies. Add this to your cookie press recipe collection! Just like a butter cookie dough, you can color this dough. Just divide it into portions to make multiple colors of cookies, adding the food coloring last. Using a cookie press can be difficult due to many factors including the surface and temperature of the pan. The dough's temperature can also make or break your chance of producing cookies in shapes that adhere to the baking sheet. If the dough is not firm enough for your cookie press, refrigerate it to firm it up more. Remember to hold your cookie press completely vertical to the baking sheet for best results. If the dough is not firm enough for your cookie press, refrigerate it to firm it up more. Remember to hold your cookie press completely vertical to the baking sheet for best results. Whisk salt into the flour and set aside. Cream butter and cream cheese together until fluffy. Add sugar, egg yolk, vanilla, and lemon or almond extract, beating until combined. Stir in the flour/salt mixture. Divide dough, if you desire multiple colors, then add optional food coloring(s) and mix well. Apply desired cutting plate shape and fill cookie press with dough. Press cookies onto an ungreased baking sheet. Bake 10 to 15 minutes, until lightly browned at the edges. Decorate as desired. For a simple icing, add just enough heavy cream or milk to powdered confectioners' sugar, so it has a liquidy texture. Put icing in a ziptop bag, squeeze out the air, and then seal it. Cut off a small corner from the bottom of the bag to use it as a pastry bag. Let air-dry to firm up. 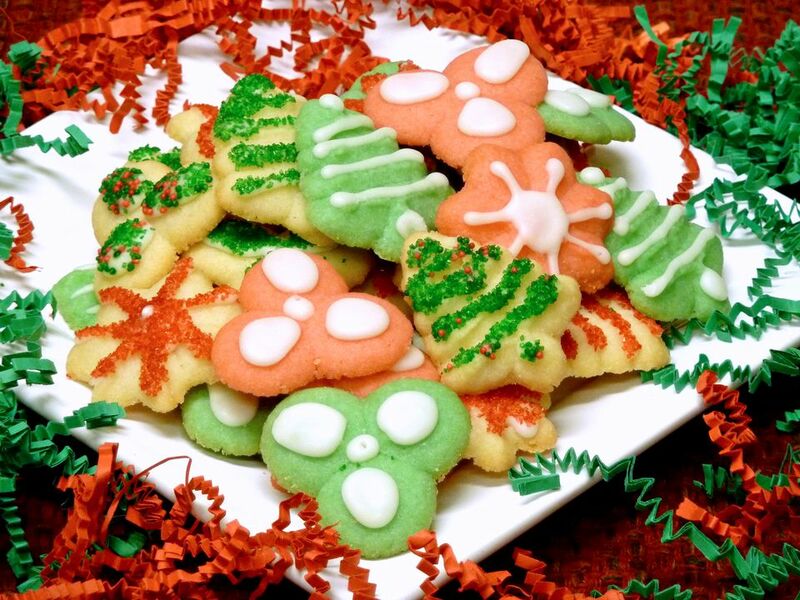 You can also help decorations adhere to the cookies by creating a "glue." Just whisk a little water into an egg white. Brush on top of cookies and sprinkle on decorations. Let sit to dry.